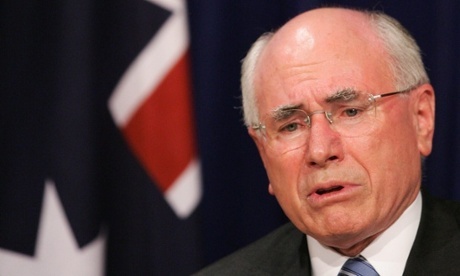 John Howard is refered to as Howard when people are really annoyed with him. Which is most of the time. Considering what Howard actually does, for the Australian Public. It’s a wonder he hasn’t been tarred and feathered and exiled to England. Where all good monachists should have to go. Howard has a dream for Australia. That dream is full employement (More tax for Howard), Lower Wages, No Unions, All Government services privitized, Increased Salaries for Politicians, Tax cuts for the Rich. If Howard can do all this while running Australias ballance of payments deep into the red with the IMF and World Bank.. So much the better. If Howard can make sure that Australians are locked into globalization by providing no alternative long term strategic views for the Australian public.. So much the better. Howard is really just making it easier for the sheep to accept the new world order. When the axe finally comes down. John Howard has questioned the Coalition’s decision to launch two royal commissions in its first year in government, saying that the process shouldn't be used for “narrow targeted political purposes”. A royal commission into the home insulation scheme has already concluded, while another royal commission, into unions, is underway. Howard told the Australian: “I’m uneasy about the idea of having royal commissions or inquiries into essentially a political decision on which the public has already delivered a verdict. Four young men died during work provided by the home insulation scheme in 2009 and 2010. The previous Labor government introduced the scheme as a way to stimulate the economy during the global financial crisis. The home insulation royal commission cost about $25m and followed several previous coronial and Senate inquiries into the matter. The commission questioned former prime minister Kevin Rudd about the scheme’s roll-out, with the subsequent report finding that the program was seriously flawed. Howard is the latest former prime minister to question how the Coalition is handling the royal commission process. Earlier this year, Malcolm Fraser and Bob Hawke expressed concern that the government would break a long-standing convention of cabinet confidentiality by handing certain documents over to the home insulation royal commission. Last week, Julia Gillard, yet another previous prime minister, gave evidence at the royal commission into trade union governance and corruption. Gillard was questioned at length about regularly repeated allegations that she used money from a union slush fund to make renovations to her home in the 1990s. Labor has accused the government of using the royal commissions as part of an ideological witch-hunt against the previous administration. Mark Dreyfus, the shadow attorney general, told Guardian Australia that Howard’s view on the use of royal commissions is telling. “Establishing legal inquiries for political purposes is an abuse of power,” he said. “Royal commissions serve our community well – the child abuse royal commission is a good example of that. But we have had two inquiries set up for primarily political purposes. “The union commission is very much a pursuit of a political vendetta. My concern about the home insulation royal commission is that millions of dollars was spent investigating something that has already been investigated eight times. Dreyfus insisted that he had no intention of pursuing a similar strategy if Labor won the next election and he became attorney general again. During Howard's his first television appearance since losing office in 2007. On the Australian Broadcasting Corporation (ABC) QandA live broadcast on the 25th October 2010. Mr Howard was forced repeatedly to defend his support of the Iraq war. It was then that Peter Gray stood up and hurled his shoes at former Australian prime minister John Howard. 'That's for the Iraqi dead!' Mr Gray shouted as he flung the shoes during the live Australia wide broadcast. The shoes missed their target and Mr Gray was escorted from the studio. Mr Gray said his actions were justified. 'I did it so there was a chance that thousands of people, tens of thousands of people, in the rest of the world, particularly in the Middle East, could see that not every Australian was behind the decision to invade and rule in the country of Iraq,' he said. While writing this.. I realized that I had certain ‘expectations’ of the Federal Government when I became dependand on them. Those expectations have changed as my experiences with recently introduced legislation has taken it’s toll. So I write this Blog.. I was surfing around the various Australian Federal Government websites last night. Yer.. Excitement.. Anyway..
“each senator and each member of the House of Representatives shall receive an allowance of £400 (four hundred pounds) a year, to be reckoned from the day on which he takes his seat.”. So in 1901 the average politician received 8.69 times (400/46) the average yearly wage. Funnily enough.. In 2007 the average Senator or Member of the House of Representatives receives aproximately $250,000 per year. Acording to the ABS In the private & public sectors, Full-time adult ordinary time earnings per week is now $1,088.40. $250,000 / $56,596 = 4.41 times. Well it’s nice to see that the politicians are ripping us off less than they ever have before. Kinda gives me a warm feeling inside. But they still consider themselves worthy of 4.41 times the average wage. I understand that decent politicians need to be funded correctly to perform their tasks. But many politicians are far less than decent in their dealings with the public. Those politicians who fail to represent the wishes of the community do not deserve 4.41 times the average pay. Lets have the means to report a politician who fails to represent us. Lets tie that politicians paypacket to their personal performance level. Allow them to ‘earn’ more than 4.41 times the average paypacket but only if they perform at a suitably high enough level. Give them a lot less than 4.41 times the average wage because they fail to perform. Give them ‘sick leave’ points they can ‘use’ at nominated times. Lets get the politicians off their bums. Out in the community. Listening to what we actually want and getting it done. Pay them according to their performance level. I wonder what My 2 kids and I are worth in comparison? We get aproximately $485 a week with every rebate we can find. $250,000 / $25,220 = 9.91 times. Another way of looking at it is.. Getting rid of just one politician would clothe, feed, and supposedly totally support 9.91 families..
And thats the numbers for the small ‘p’ politicians. The Treasurer, Prime Minister, and other cabinet members can get up to double this amount. $500,000 / $25,220 = 19.82 times. Don’t forget that they get a percentage of that income for the rest of their lives. This endless pension drains our economy. To think they ‘milk’ the system for what it’s worth and then refuse to provide a fair system with decent safeguards for the multitude. Everyone pays tax. It’s that tax the Politicians feast from. Even though I have been receiving Federal Governmnet assistance for some time. I payed my taxes into the system. I gave the Federal Government all sales taxes when I was in business. I saw others who knew a ‘sales tax’ loophole existed. But I never gave in to temptation. Even though I knew most of the other retailers were doing a sales tax rip off. Like a fool I religiously payed the sales tax on everything I ever purchased. If I was claiming an exemption. It was because I actually had a signed Exemption form. So when it is time for the Federal Government to help me. I expect it. Actually I demand it. I feel I have fulfilled my mutual obligation. But I feel betrayed when I realise that the Federal Government that is so happy to take my income when times are good. Are not so happy to return some of it when times are bad. In fact they make it down right difficult. They fiddle with social security to make it damn near impossible to qualify for various payments that they supposedly offer. I don’t care how stupid a politician you are. You dont screw with the fundamental expectations of a generation. Just to post some budget surplus. Did I foolishly trust previous Governments not to ruin Social Security? sigh Yes I did… Well I was wrong. Seems like 50% of the Australians think the sun shines out of the purified oraface of the Prime Mangler, John Howard. Howard (like all Liberal/National party politicians) will have us all working for peanuts. Meanwhile the fat cats get fatter. The average wage will keep getting higher. But the working man will still be counting his pennies. Its the top end of town where they get millions of dollars in bonuses, for 6 months of service, that drags up the artificial average wage.. Those on the ‘Boards’ the faceless ones who make the decisions. The real average wage is probably around $650 a week. If ya lucky.. I would say..
Those scheming politicians justify their fat pay packets by comparing their services to that of a top paid executive. Please.. Just don't annoy me.. I say to them. You want to upset my expectations? Then let me upset yours. Go back to your top paid jobs. You disgusting fat cats. If you dont want to accept a pay cuts. Go work for the Coporations. Leave the positions in Government open for those who really want to make a difference. A good politician would accept pay cuts and an ‘independant pay performance review’ in the name of decency. Shame the rest of them into agreeing with a fairer system of pay. Just to make a real difference in this corrupt system. Do away with this endless pension scheme while we are at it. These Politicians shouldn’t upset my expectations of ‘giving everyone a fair go’… I will reveal them to the Australian Community for what they really are. Most of the Politicians are just mindless pawns of the Corporations they serve. At the moment their Social Security policies are hidden from the mainstream public. Because not all people have to fall back on the Federal Government for financial assistance. But if they did. I have a feeling most would become as disillusioned as I have become. Another thing I have to comment on. Is that the sheer bribery that is happening just prior to the Federal Election. I find it particularly disturbing. They are both out of control. Promises to do this. Promises to do that.. Whatever they have to say. Wherever it will win an electorate. Virtual Australian Tax Dollars being splashed around by both sides. If I were Kevin Rudd. I think I would have taken the stance that he will behave fairly with the Australian public. Which will, of course, cost a heck of a lot more than the liberals were prepared to spend. But thats not my call to make. Just a hope. Howard Government - The Good Guys? The Howard Government is offering everyone affected by the Victorian Floods some cash. (Sorry to anyone severely affected) $1000 if your premises is unlivable for 48 hours. Better than nothing I guess. I wish my floor was flooded. I could do with the $1000. I noticed that the Howard Government is particularly busy at the moment offering aid to various people in distress from natural disaster around the country. I counted 6 programs currently running in 2007. Election year. Funny enough. Last year I only saw 2. Just a good year. I guess. The year before was a good year too.. The Howard Government are normally very tight fisted with Tax payers dollars. But 2007.. The Howard Government are busy helping people in distress. Which I dont take issue with. What I take issue with is the Howard Governments attitude when not in election mode. Howard Government - The Bad Guys? Not so happy to help then are they? The cash is kept tight in the fist. Why? Well.. Lokks like for lots of TV Advertising. So they can get re-elected… Dang it. We are being Bombarded over and over with millions of dollars worth of Howards unrelenting, brainwashing, political, TV advertising. That we (the Australian Taxpayer) paid for!!! They dont pay Doctors enough so that they will bulk bill. Everywhere Government Departments are just figurheads with funding slashed providing absolute minimal services at maximum cost to the public. They have become privatised in almost all but name under Howard. As each department struggles to provide services under a Prime Minister and Treasurer who only want to post a budget surplus and care little for the people of Australia. Yet that same Prime minister and Treasurer happily waste millions and millions on TV advertising and bribery to get re-elected. Honestly Australia. Re-elect Howard and sign your rights, freedoms, and expectations futher down the dunny. I’m gonna blog the CentreLink BS. See what the world thinks about John Howards latest antics against the poor in Australia. Did you know that in the 1970’s the poor had such protection, the Federal Government were required to give 3 months notice, of their intention to dishonour payments? Landlords are fully aware of the new status of the single parents. Finding Rentals for single parents has become significantly more difficult. As Landlords now consider a single parenting payment as being no more secure than a standard unemployed persons ‘New Start’ payment. (Which is an accurate estimation) So as a direct result of the Howard Government changes to the system. Landlords are suddenly unwilling to rent to single parents. If a single parent or other person dependent on Government income fails to respond to CentreLink ‘requests’. Within 2 working days their income will be stopped without futher communications. The first you know about it is when you go to the bank and the cupboard is bare. In my case. Living 42 Klms away from Millicent. Going to the bank and finding that there is no money means not only a fearful week ahead. But even returning home has now become a logistical problem. When you complain about the way CentreLink are treating you. They just say that it is out of their hands. The politicians have made the laws. The laws must be upheld. There is no good complaining about it. They don’t make specific laws for rural people. Well.. These laws need to be changed. These laws are John Howards laws. Bought into place with his absolute majority that he temporarily enjoys in the upper and lower houses of parliament. Thinking people know that the voting public of Australia were fooled into voting back the Howard Government again. Totally due to John Howards direct misrepresentation of facts, and his willingness to manipulate the base fears of the voting public. This is Just too Corrupt! Something I see he is up too again.. As I am bombarded with Liberal Party advertisements on our Free to Air TV. The millions of taxpayers dollars that Howard wasted trying to promote his Government prior to the “official start” of the election cycle is particularly corrupt. If Howard gets back in. He will take that as his “MANDATE” to keep changing everything to suit his business cronies. Please Australia don’t allow it to happen again. This is too depressing.. I will blog more later.